Howdy everyone. I appreciate all of your kind words and sentiments for me and my family over the loss of Quincy dog. It has been more than two weeks now since we had to put the fat basset down and we are doing OK. It has been tough, and every day gets a little easier but we still miss Captain Furry pants a lot. One of the hardest parts has been being home because we are so use to his presence when we are at the house. The clickity-clack of his nails coming down the hallway, the thwack of the doggie door as he goes outside to take care of business, the beautiful basset face waiting for you at the front door after you got back from running errands, the howling when the phone rings, and the buddy who will snuggle with you on the couch when you are ready for a nap. Our home and lifestyle has always had the basset in mind so we see him everywhere. So that is why it might not surprise you that we will be getting another basset hound in a few weeks. We had a basset hound owner stop by the house recently to see how we would react, and it surprised Mrs. Shife and myself how nice it was to see a basset in the home again. And Baby Shife got so excited seeing the pooch as he followed Harvey around saying "Dog!!!" over and over again. 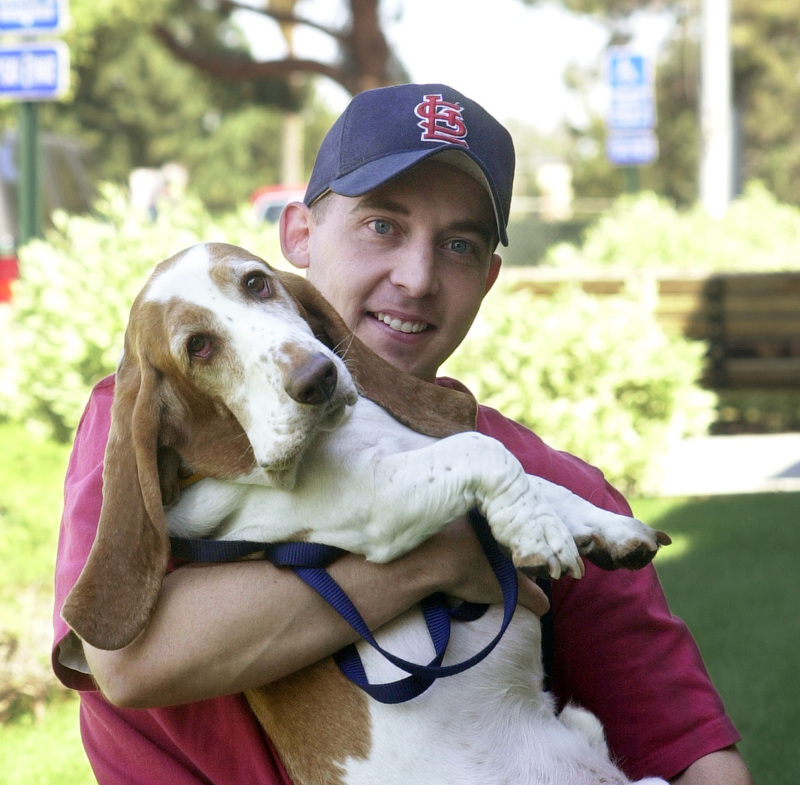 We are dog people, and the rescue we are going to visit, the Utah basset hound rescue, has 50 dogs that need a home and we feel like we can open our home to another basset. At first I was worried that I was being disloyal to Quincy dog by already thinking about another dog, but I know he would be happy that we are bringing another soon-to-be fat basset to Casa de Shifley. We will go down and meet a few bassets to see which one is right for us. Feel free to click on the link and let me know if you have any favorites. Quincy will always have a special place in my heart, and my love for him will be unique. However, I know that my heart is big enough to welcome another dog into the household and it will be good for all of us. Do you have a suggestion for a name? Right now Dexter and Bosworth are the leading contenders but we would love to hear your ideas. Hope you have a great weekend and thanks for thinking of me. Oh Just Bob, Quincy would have been called Bob if I had my way but Mrs. Shife thought a basset hound deserved a more regal name. I suggested Sir Bob but she didn't budge. I will see how open she is to Bob again but don't count on it. Hi Shifey, I was sad yet happy to see you holding Fat Bassett, it's a wonderful keepsake picture. Good of you too, I might add... grins. You've done good to think of going for another, but don't think of it as being a replacement ... it's an addition and like you say Quincy would be delighted. Yep, I'm sure of that. I like both Dexter and Bosworth, but if you're into calling the hound Dexter rolls off the tongue better. Got me? Thanks for your lovely comment about my doggystory, part 2 is going on line at 1pm my time (UK) and will stay there for one week. Thank goodness for Blogger's forward planning ... more grins. Between Dexter and Bosworth I favor Bosworth. It's a tad more regal with just the right amount of hokey. Besides, Dexter's starting to get a bit played out and it makes me think of the serial killer show on HBO (of which I was once a fan of but am now totally over). That's really wonderful news to hear, and it makes me smile to hear it. Rescuing a dog is always the best way to go. Good to see you back on and posting. I LOVE LOVE the name Bosworth for a bassett hound. What nice news! So rewarding to offer a wonderful home to a dog in need! Long live the memory of Quincy and long live the new special friend!! i might go for jonesy to keep quincy's memory alive as in quincy jones. Sinbad. Every one should have a good pirate name. No suggestions, just congratulations on opening your heart and home. Okay. I love the name Louie. And my verification word? harry. No kidding. I think you should wait until you meet your new dog friend. Cause you'll just look at him, or her, and know it's the one for your family and what its name should be! Glad to hear that you're doing as well as you can after having to say goodbye to Quincy. It's always sad to let a beloved pet go. Well, if it can't be Bob then my vote would be Beauregard. I follow my sis's, DG, suggestion. You might think you have a name all picked out, and wham! those names just don't fit! Keep those names in mind and then see how it goes when you arrive at the rescue! Bosworth to me reminds me of Brian Bosworth... just me! Dexter or Dex sounds regal too. Have fun naming your new addition when you bring him or her home. Woof--- from Pepper and Smokey... the canines in NC! I am a dog person too, always have been always will be we have talked about getting another one before we have to put Baxter to sleep. I dunno though. Glad you all are doing better! hey Shife :) I had the same thoughts you did when I lost my Leo back in the fall of 2007...remembering all the noises and looks and greeting us at the door. It really does take time and we did what you are doing. About 7 mos later, got another pet, and it does help. I feel for you, I've been there and know it hurts. I think it's cool that you are getting one from a rescue place though. Okay, that's been done before but you have to admit it's a keeper. Good for you and your family for opening your hearts to another basset. That baby dog will be much loved. Oswald. You guys should definitely go with Oswald. Yay! I cannot wait to see which one you choose. I think I might be in love with Elwood. As for Quincy. I think that he would be glad that you are rescuing a basset in need of a home. I love the name Dexter! And I am very glad to learn you will soon be hearing the clickety clack of toe nails on your floors again. Just wanted to pop in and say "I'm BACCCCCKKKKK!" and it feels good! Missed you darling friend!